Saigon, or Ho Chi Minh City as it’s officially known, is the largest city in Vietnam with many visitors flying into the city before moving on to explore other parts of the country like Hoi An, Hue or Hanoi. 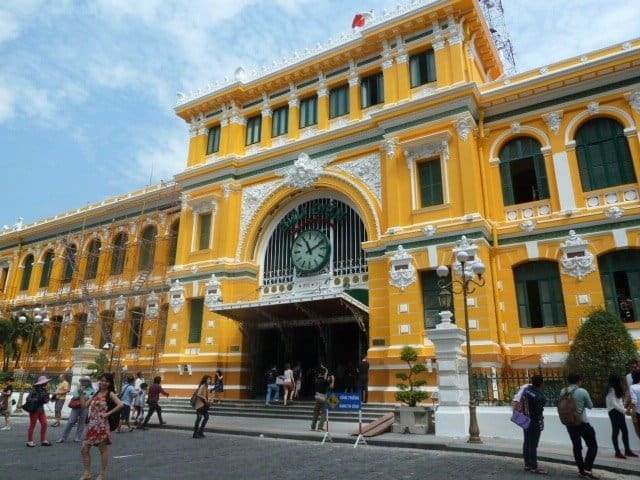 It’s a city of modern high-rise buildings, traditional Vietnamese tube houses and French Colonial architecture. You’ll find street-food, Pho stalls and high-end eateries, parks, markets and shopping malls. Here’re my tips on what to see in Saigon and how to get the best out of 48 hours in this frenetic city. But first you need to know about the traffic…. On arriving in Saigon or Ho Chi Minh City, as it’s officially called, the buzz, clamour and noise hit us before we’d even left the airport. As our luggage was loaded into the boot of a cab outside arrivals a small, gesticulating woman appeared from nowhere on the back seat beckoning her family to join her – and our luggage! We eventually persuaded her into another cab, became reunited with our cases and pulled out into the overwhelming foray of cars, scooters and buses amid incessant horn honking. At least twice on the journey to the hotel my stomach flipped and I had to cover my eyes as we came within a hair’s breadth of a collision as scooters, bikes and cars seemed to make a bee-line for us before swerving out of the way at the last nano-second. 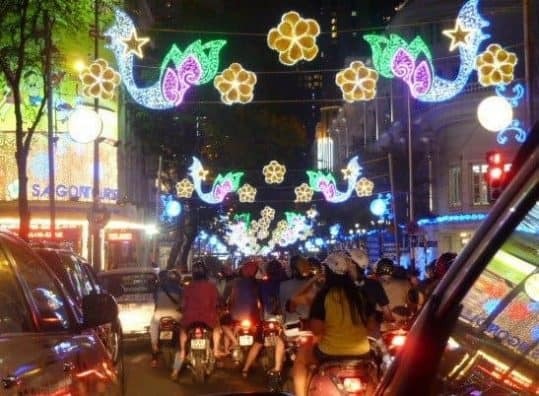 The traffic in Saigon isn’t for the faint-hearted and I’ve written about it before such is the massive impression it leaves. Four years on and there have been some changes. Some for the better. Some not. There are traffic lights now, and some pedestrian crossings, which makes it slightly easier to cross the road although you’ll still need to check both ways (even if you’re in a one-way street) and cross slowly letting any scooters weave around you because they don’t all stop at the lights. But here’s the thing. To avoid waiting at the traffic lights scooters just mount the pavement and ride along that until they’ve passed the red light. I’d be walking along the pavement, hear a beeping and look round to find half a dozen scooters following me along trying to dodge past me. And not slowly either. Tip: don’t stand on the dips in the kerb while waiting to cross at the lights as this is the entrance/exit point for the pavement scooters. 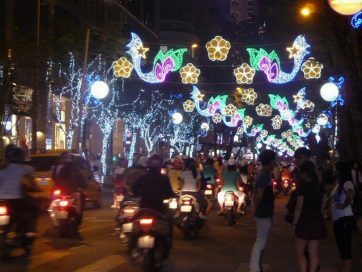 You will get used to the traffic and it became a source of entertainment and Saigon sightseeing. We’d find somewhere for lunch with a view of a roundabout or a cross-roads and just sit and watch in total amazement. 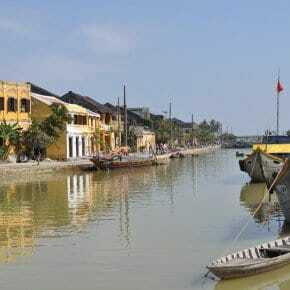 If you can’t beat them why not join them and take a tour of Vietnam by motor bike. Seems to me to be the perfect solution. 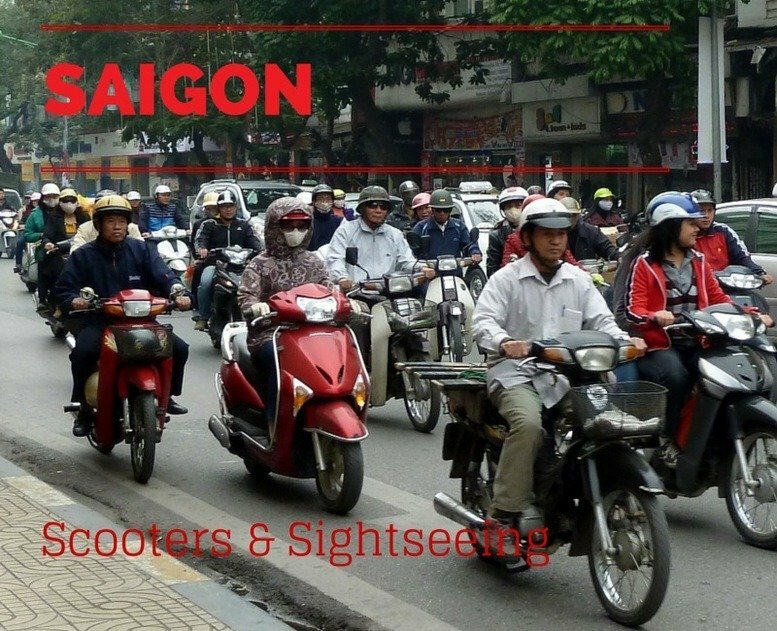 So, now that we’ve covered the traffic what should you see in Saigon? 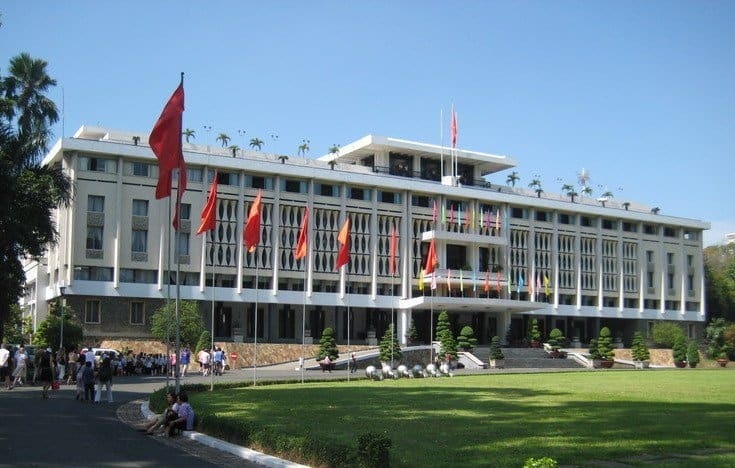 In District 1 at 106 Nguyen Du Street is The Reunification Palace, formerly Independence Palace, where the the North Vietnamese tanks tore through the gates on 30th April 1975 marking the end of the war between the north and south and the fall of Saigon. The same tanks, aircraft and other military vehicles are displayed in the grounds of the palace. For an entrance fee of around $1 you can discover the interior of the building. Inside is a bit of a time-capsule as it remains almost as it was when everyone legged it when the tanks arrived. Worth seeing are the austere war rooms and maze of basements, control rooms and offices housing the old communications equipment which convey a real sense of the city’s history. The private quarters smack of sixties kitsch – a total contrast to the stark basement rooms. Open daily 7:30-11am and 1-4pm. Tip: Beware the coconut water sellers who ply the streets around the palace – they’ll try and charge more than $5 per drink if you’re not careful. 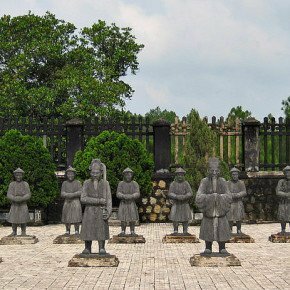 The War Remnants Museum, originally named The Museum of Chinese and American War Crimes, although harrowing at times, shouldn’t be missed. There is a heavy emphasis on American involvement but also a call for peace. This is a graphic encounter of the horrors of war; the effects of Napalm, Agent Orange and the massacre at My Lai. I first visited in 2009 and some of the images have left a lasting impression on me to this day. That said it is incredibly interesting and the room devoted to the work of 134 journalists killed whilst covering the war was compelling. The courtyard outside houses tanks, bombs and aircraft. Give this one a miss if you have children with you. Central Post Office is a daffodil yellow building near to the Cathedral. It was designed and built by Gustave Eiffel in 1886 and is to this day a working post office. There’s a long, domed roof, polished wooden counters, decorative tiled floors and a large portrait of Uncle Ho looking down on proceedings. If you go early enough you can pick up a free postcard to send home but they go quickly. Just over the road is the impressive neo-Romanesque Notre Dame Cathedral. 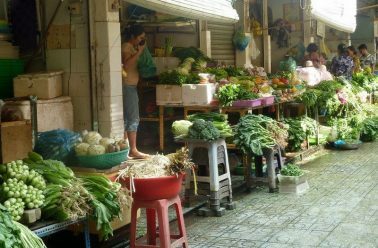 There are two main markets in Saigon and Cho (market) Ben Thanh is probably the biggest and the best known. 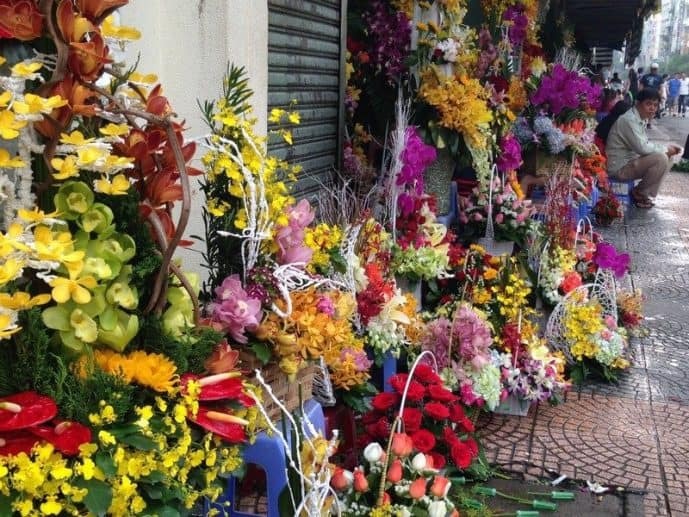 It’s located in District 1 across from the bus station near to Ben Thanh Roundabout (a great traffic-watch spot). 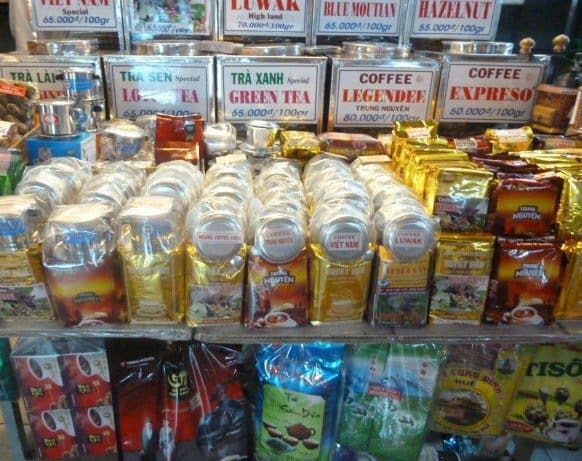 The market sells just about anything you can think of from essential housewares, clothes fresh produce, meats, fish and countless types of coffee to souvenirs and tourist trap trinkets. 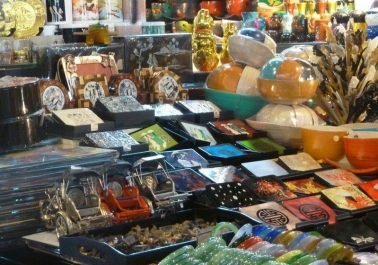 You’ll need to have your haggling head on because stall-holders start at outrageously high prices but they’re generally up for some banter and we had quite a laugh during some light-hearted haggling. Some traders can be a bit pushy so watch for a while and choose your stall carefully. I bought some cute little bowls and probably paid more than I should have but I was happy with the price. 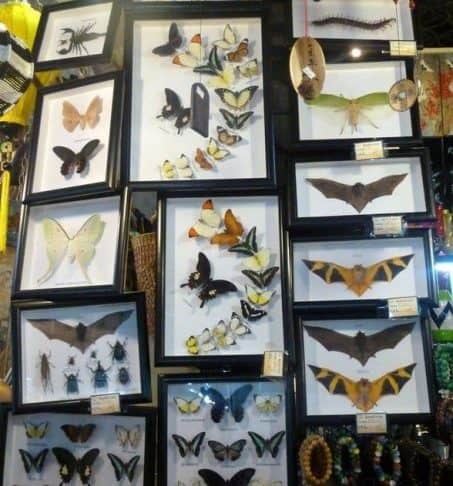 I get the feeling the stall holder was happier! A Bonsai dinner cruise on the Saigon River will give you the chance to see the city from a difference perspective and have the chance to feast on some fabulous food. The wooden double-decked boat from Northern Vietnam is a replica of a royal Vietnamese-style dragon boat and the views as it sails past the neon lights of the city reflected in the water are stunning. There’s entertainment on board in the form of traditional Vietnamese dancing and music but it’s the food that really shines with a Euro-Asian Buffet dinner with live cooking stations. bonsaicruise.com.vn. 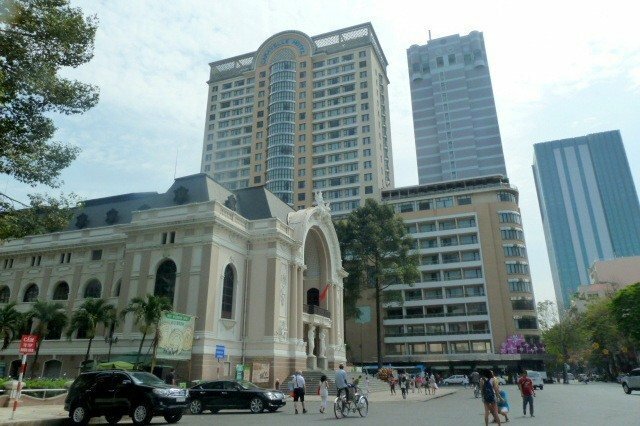 While in Ho Chi Minh City we stayed at The Caravelle in District 1 which is walking distance to many of the city’s major sights. Check availability and rates at Caravelle Saigon Hotel. We’ve stayed at The Rex Hotel in the past and both of these Saigon hotels have fabulous rooftop bars which were frequented by war correspondents and military officials during the Vietnam war. Saigon Saigon, the iconic bar at the Caravelle, has panoramic views of the city and is the perfect place to sit and watch dusk fall as the city lights up. They also serve a mean gin and tonic. It’s located right next to the Opera House within easy walking distance to all the above sights. We were in Saigon for New Year which we celebrated at The Rex Hotel with a fantastic banquet and entertainment. Check rates and availability at The Rex Hotel The Rex Hotel. 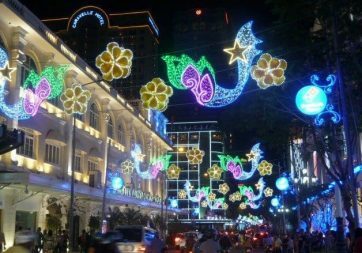 Saigon really gets into the spirit of the season around Christmas and New Year with colourful lights strung across the streets and seasonal music blasting out everywhere. 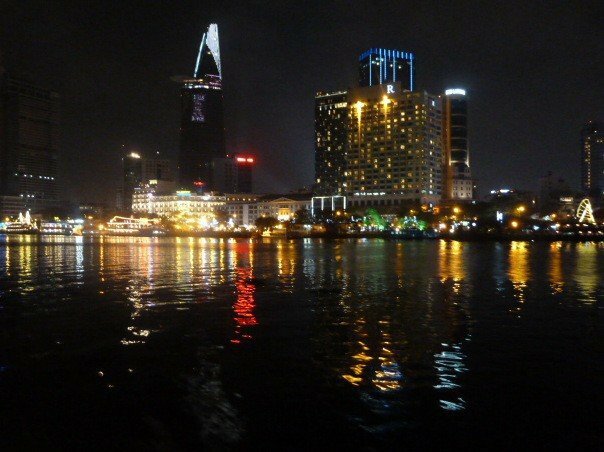 Here’re some shots of Saigon by night, a city which is actually more colourful than during the daytime! 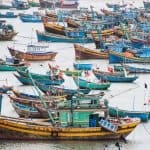 Have you been to Hanoi or Ho Chi Minh City? What did you think of the traffic…? Disclaimer – there are affiliate links in this post. This means if you make a purchase after clicking through I’ll earn a small commission at no extra cost to you. This really helps with the upkeep of this site so thank you. 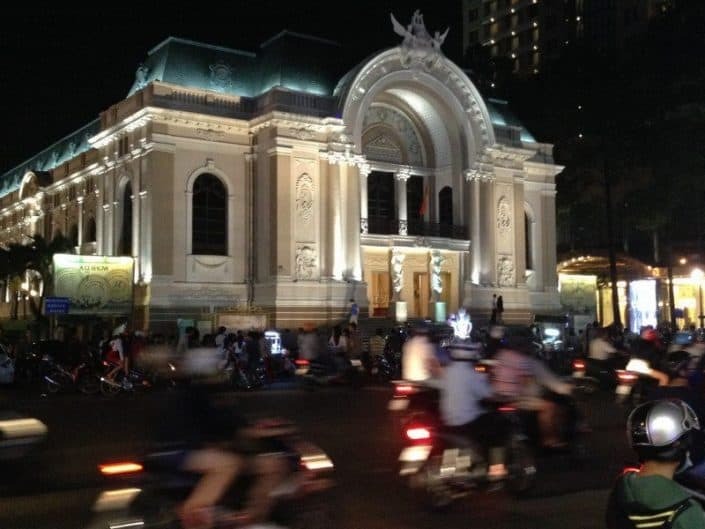 How Many Motorcycles in Ho Chi Minh City? What a place to spend New Year. I wonder if the traffic is more manic than in Athens ???? Because that is the worst I ever seen and that was in the mid 70’s and it has to gone worst by now. Another great post – your are so good at this. I think Athens is probably worse because it’s mainly cars which tend to go faster – the scooter go so much slower in busy areas. Thank you Vivi – glad to know I’m doing something right! Saigon is one the places that I hope to be visiting this year, so thanks for post. I went to Hanoi last year and enjoyed the city. The bia hoi was cheap and a fantastic experience in the bia hoi corner. The traffic does look just as crazy as Hanoi’s! I really liked Hanoi but haven’t been for a few years. I think the traffic is busier there than in Saigon – you’ll have to let me know after your trip! We’ve done the Hanoi route down to HCMC twice before and at this time of year we wanted some warm weather so we stuck to south and south central. 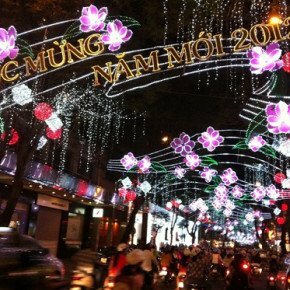 Lovely to have family in Saigon – have you been for New Year? 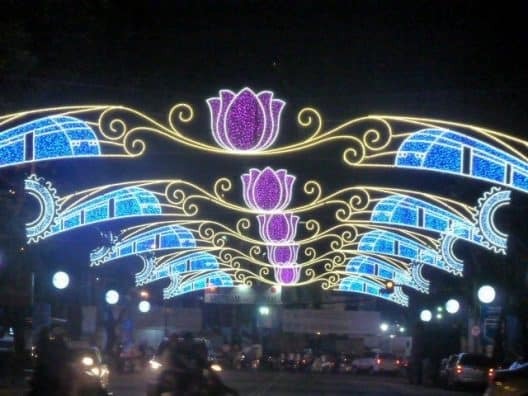 Lots of the streets are decorated with flower lights over Christmas and NY – they look soooo pretty! 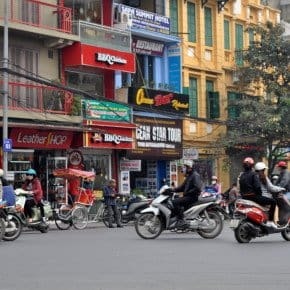 I made it to Hanoi but not to HCMC when I went Suzanne so I’m glad you said you slightly prefer Hanoi but nevertheless, I loved Vietnam and would love to return to see Saigon and it sounds fascinating historically. I really struggled with the traffic – even in England, I’m always the one who waits till it’s totally quiet before crossing so you can imagine how long it was taking me out there. Each step I took came with its own set of palpitations 😀 The Bonsai river cruise sounds so lovely! I’d love to do that if I go back. Most visitors start in Hanoi and work their way down the country flying out of HCMC or vice versa. We stayed in the south of the country this time as the weather is much warmer/dryer down there. Saigon traffic has to be seen to be believed! ‘You’ll still need to check both ways (even if you’re in a one-way street)’ <- I don't know whether to laugh or gasp! Glad you survived!! It’s the craziest traffic I’ve ever seen – but once you step out into it they just seem to weave around you. So long as you step back or do anything silly it seems to work! What an amazing city, but, oh my goodness, that traffic. Lucky you celebrating New Year there. Happy travelling in 2015! Don’t think I’ll ever forget the Saigon traffic madness! Like the idea of getting out on the water for a boat trip, nice to get a different angle on the city. The food on the boat was sooo good and it was nice to get away from the traffic! I like the idea of getting a restaurant table with a view of the traffic! I found it scary when I was in Hanoi but got used to it after about two days. 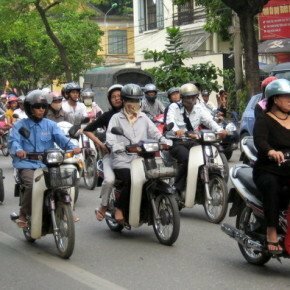 If push came to shove, would you recommend Hanoi or Saigon? I actually prefer Hanoi to Saigon Richard – it seems more colonial with fewer skyscrapers, a prettier city I think. But the traffic is just as scary!